I am working on my "official" Podstock post, but in the meantime I wanted to share our trip from Wichita back to Prescott. My Droid's GPS went flaky at some point during our stay in Kansas. I did a search on Google and came up with various solutions (one of which required about 20 steps leaving my head spinning at the very thought of attempting it - I did NOT follow those steps!). I found one person who said, "Turn off the phone, take out the battery, wait, put battery back in, turn the phone on, start Maps and wait." That worked, though I also use an app called "GPS Status" to check on, well, my GPS status. I whole-heartedly recommend you get that app if you use your GPS. Once the GPS was working again, I programmed our destination into the phone and we were ready to roll. The gas station across from the hotel is open 24 hours a day...if you want fuel. Want souvenirs? Monday-Friday only. DOH! Oh well. I should have purchased goodies at the Prairie Rose Chuckwagon Show when I had the chance. Live and learn from our mistakes, I guess. Sidenote: After I got to Prescott, I met Shan and the kids at the church and our preacher's message was "Sieze the Moment." I did not do so in Kansas as far as goodies go, but I will not make that mistake again - I will Sieze the Moment! Where was I? Ah yes, we fill up the tank and follow the directions to the on-ramp for I-35 South. As it turns out, the nearest entrance for us was.... CLOSED due to construction. Undeterred, I take the on-ramp for I-35 North and we get off at the next exit, make a quick turnaround, and cruise down the road heading south. Somewhere, I got distracted and missed the Rte400 > I-235 South entrance that the GPS told me to take. So, the GPS adjusted our course and we followed I-35 to 412 basically to Tulsa, where we grabbed 244 and kept on trucking. But, if we had simply done that, we would not have the adventure to remember, would we? The order of events a little foggy in my mind, but I will relate them anyway. I-244 outside of Tulsa is under construction. Or, rather, I-244 outside of Tulsa is GONE! There is no road. There are no bridges. There are several pieces of equipment, but the entire road has been removed from existence. I'm sure someone is putting it back when they're done with it, but for now, the area is a wasteland. When lunchtime rolled around, we decided to stop at Arby's for a bite. I decided to visit the men's room to wash up and such before eating. I opened the door and closed it without a second thought. When I turned my head toward the facilities, I saw an older man dressed in his Sunday clothes sitting on the commode with his pants around his ankles. The urinal was mounted on the wall next to him. As you can surmise, there were no partitions. "Oh, I'm sorry! The door was unlocked. I didn't realize anyone was in here," I said as I backed toward the door. "No problem! Come on in. You won't bother me any." He began fiddling with the underwear caught in his breeches. It was really more than I wished to experience. I quickly stood at the urinal, not quite sure how to handle the situation. I opted to look straight at the wall in front of me and did not say a word. The whole time, my mind raced, wondering if I should say something to engage conversation. Does one strike up a conversation when there are no partitions? I wished I had just walked out as soon as I saw him. I wished I could get done with thins a heck of a lot faster than they were happening. I finally opted to get quit, wash up and get out. I wished the old man a good day, not sure if the man was actually in need of assistance, as he appeared to be almost falling off the commode while fumbling with his clothes. I decided he was handling things fine on his own. Besides, there was no way I could picture myself being to help this total stranger with his pants around his ankles without the whole thing just being....weird. It was weird. 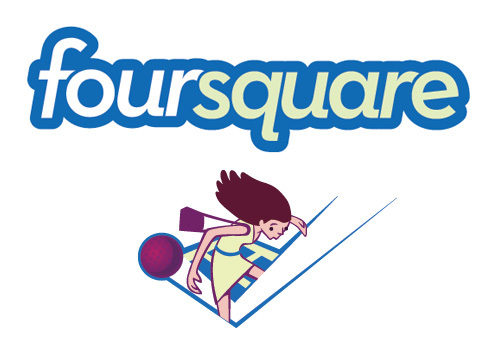 The entire trip home, Doug and I checked in to our FourSquare accounts, posting the places we visited as we made the journey home. It was fun, funny, and completely nerdy. Unlike the trip TO Kansas, the return trip found very few (if any) live animals for us to dodge. Instead, roadkill seemed to be flavor of the day. Skunks, armadillos, raccoons, and critters no longer identifiable left their marks on the roads. After lunch, we drove for a while and decided to stop for a break and some ice cream. Along the Indian Nation Turnpike, EZ-Go (or Kum-and-Go) gas stations and McDonald's restaurants have replaced the HoJo's of olden days. We walked into the hottest Mickey-D's I have ever experienced. It was so hot and humid inside that when someone opened the door, a cool breeze came INTO the place! A family sitting at one of the tables near the line must have been locals. The man said, "Welcome to the hottest McDonald's in the world. (Name of Owner) doesn't believe in air conditioning." his wife smacked him and told him to be quiet. He retorted that the statement was true. She rolled her eyes. "What!? It's true!" He took a bite of his Big Mac. I simply agreed that it was hot. In addition to that, the line merged from two directions at the single open register. Yeap, that's right. Twenty people in line and one register. What was the manager doing? Fries. Lovely. At some point (no less than 20 minutes by my estimation), we ordered our ice cream. Five minutes after that, we got our snack. Speaking of the turnpike, did you know that Oklahoma does not actually "welcome" you to the state. There's just a sign. It says, "Oklahoma." There's probably a subtitle that reads "You're here. Our two-lane roads have a 65mph speed limit. What else do you want?" 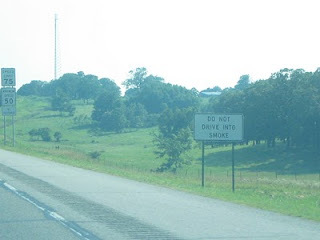 Oh, Oklahoma also has signs posted along the highway that read "Do Not Drive Into Smoke." As we were driving along, we crested a "hill" (I use the term loosely when referring to OK) and saw... SMOKE! Holy cow! Off to the right, a plume of smoke rose behind some trees. Oh my goodness, what were we going to do!? We hurtled closer and the wind seemed to be in our favor as the smoke only lightly wafted above the road. As we passed the source, it turned out to be someone burning leaves or trash or something in their yard. Nothing to see here, folks. Move along. We all cheered when we saw the "Arkansas Welcomes You" sign as we headed for DeQueen. In Oklahoma, we could travel at 65mph on the backroads. Legally. Really, it's posted! In Arkansas, it's 55. I know that doesn't sound like much, but think about the difference between sitting still and going 10mph. You see? Of course, if that weren't enough, we had every person pulling some kind of trailer pull out in front of us in a no-passing zone. I think at one point, I considered just gunning the vehicle and pulling off a "Dukes of Hazzard" jump off the ramps on the back of one flat-bed. Except we weren't in my Charger. I figured Phoebe wouldn't care much to have her SUV hurtling through the air over a farm truck. I could be wrong. We pulled into Prescott, and I met Shan and the kids at church. Since we got there before they did, I stood in the parking lot beside my suitcase. I had on shorts and my Podstock t-shirt. I looked like I had just come from a mission trip. I suppose in a way, I had. 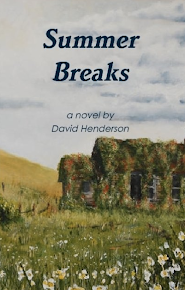 Summer Breaks: a novel IS PUBLISHED! "I made Mickey Mouse with my muffins!"